Most of our items require a 1-2 week processing time (usually less). We realize that there are last minute needs, and we can usually help you with that. If you require delivery by a certain date, please let us know, and we will let you know asap if it is possible. All of our Wedding and Party Table Signs, come with a detachable round base. This opens up many possibilities on how to style them. 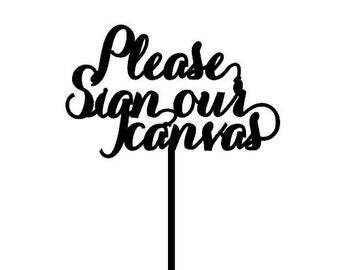 From a self standing sign sitting proudly on your table or using them without the round base by inserting them into a floral centerpiece. This is also an available option on our table numbers. Please check out our small video on our About section. Initials Cake Topper - Two Initials Cake Topper - Two Letters Cake Topper - Heirloom Initials Cake Topper - Initials Wedding Cake Topper. Gifts and Cards Sign - Party Signage - Gold, Silver or DIY - Laser Cut Gifts And Cards Sign - Elegance Line. Large Two Initials Monogram Sign. Event Sign. Wedding, Anniversary. Inspirational Christian Art - Home Decor - Bible Verse Wall Art. The Fruits of The Spirit. I do like the sign, it arrived fast, and is cute however I thought it would come with a small stand like the picture? Perfect cake topper for my daughter's Quince! Love Is A Piece Of Cake - Love Cake Topper - Wedding Cake Topper - Gold Script Cake Topper - Elegance Line. We are a small family owned business that loves to do what we do. Bringing to you beautiful handcrafted decor for your special events and home. We offer you many items that we have designed and made. Each person in our family team has unique talents which allow us to offer you a variety of decor items. From beautiful cake toppers and signs for events to modern and pretty floral wreaths and home decor signs. Please feel free to browse through the different categories in our shop to find the unique items that you are looking for. Our products are 100% source and handcrafted in the USA. First off thank you for visiting our shop. We are a family run home business where we place integrity, inspiration and innovation in all our products. Since we are a small business, we are able to give an excellent eye to detail. Thank you! Website	the website that you are currently using, thevirginiaartisans.com.com, and any sub-domains of this site unless expressly excluded by their own terms and conditions. 4. For purposes of the applicable Data Protection Laws, The Virginia Artisans is the "data controller". This means that The Virginia Artisans determines the purposes for which, and the manner in which, your Data is processed. 16. Technical and organisational measures include measures to deal with any suspected data breach. If you suspect any misuse or loss or unauthorised access to your Data, please let us know immediately by contacting us via this e-mail address: info@thevirginiaartisans.com. 21. To make enquiries, exercise any of your rights set out above, or withdraw your consent to the processing of your Data (where consent is our legal basis for processing your Data), please contact us via this e-mail address: info@thevirginiaartisans.com. 30. Before the Website places Cookies on your computer, you will be presented with a message bar requesting your consent to set those Cookies. By giving your consent to the placing of Cookies, you are enabling The Virginia Artisans to provide a better experience and service to you. You may, if you wish, deny consent to the placing of Cookies; however certain features of the Website may not function fully or as intended. You may contact The Virginia Artisans by email at info@thevirginiaartisans.com. We do all that is possible to ensure that your items are carefully prepared and packaged. We do our utmost to ship them on time. Once we hand over the package for mailing, we have no control on what happens. We use USPS for all orders domestic and international. The postal service does a great job in handling the mail, however delays or losses can occur. If you prefer, please convo us and we can give rates on insuring your package. Please ensure that your address is correct in Etsy as this is where we will be mailing the item to. If you need to change the shipping address, please contact us so that we may make the necessary adjustments. Buyer will be responsible for the shipping costs. We will ship our international orders by USPS First Class International. This is the least expensive option. Please be aware that it does not come with Tracking, Insurance or Delivery Confirmation. USPS First Class International takes approximately 7-10 day, however it may take longer. If you require Tracking, Insurance and Delivery us know and we can upgrade your shipping to USPS Priority International. Who is responsible for international custom duties and taxes? To our international (non-US) customers, please take note that any duties, taxes or fees levied by your country are your sole responsibility. We cannot and will not quote any international fees and will not be held responsible for them. We charge you only for the actual USPS shipping cost. Please be advised that there will be absolutely no returns or refunds due to customs fees. Non-custom made items may be returned for exchange or refund if we are notified within 3 days after delivery. Upon notification and approval, please ship the item back. To receive a refund the buyer must pay for the return shipping. To exchange an item the buyer must pay for the return shipping and also for the exchange shipping. All returns and exchanges are expected to be in their original packaging and in unused condition. When we receive the package and upon our inspection a refund will be issued less a 15% handling and restocking fee and original shipping charges. CUSTOM DESIGNED or MADE ITEMS ARE NON-REFUNDABLE. We strive for superior customer service an satisfaction. If the reason arises that you are not satisfied with the item, please contact us through a Convo so that we may have the opportunity to fix the problem. Please do not leave negative feedback before allowing us the opportunity to remedy the issue. Can I cancel an order once submitted? We understand that people can change their minds and we will gladly cancel any non-custom order if the request is made within three days of purchase. Custom orders cannot be cancelled, as we will begin almost immediately to design and process your order. There is normally a 2 week manufacturing period before your item is shipped. We know that last minute emergencies arise to where you need your item quick and you cannot wait for the two weeks. Our manufacturing days are Monday through Friday.